The Diopsys VEP test is a painless, easy test that helps determine how your eyes communicate with your brain in a way no other instrument or vision test can. 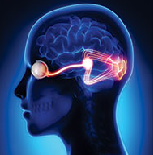 Visual evoked potential (VEP) directly measures the electrical activity in the visual system. When light from an image enters the eye, it is converted into electricity at the retina and travels through the optic nerve and other pathways to the part of the brain that processes vision called the visual cortex. The Diopsys VEP measures the strength of the signal reaching the visual cortex and how fast it gets there. 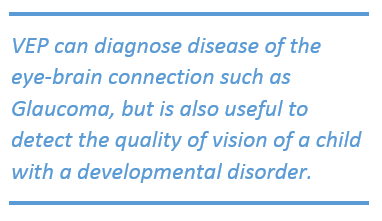 What Developmental disorders and diseases is the test for? VEP has been demonstrated to aid in the diagnosis and treatment of many disorders including amblyopia, brain injury, stroke, glaucoma, multiple sclerosis, retinal disease, and other vision-related issues. First the technician will prepare your skin to be clean, dry, and free of any lotions or oils so the sensory pads can be placed on your head. Once the test begins, you will see a series of black and white patterns that appear to �flip� quickly over and over again on a computer screen. It is simply a matter of looking at the pattern for the duration of the test. The computer will capture the information and produce a report for the doctor�s interpretation of the results. All medications should be taken as usual unless otherwise directed by the doctor. Hair should be clean, dry, and free of any gels, sprays, or oils. It is important that you feel relaxed and comfortable so the test results are accurate. For young children it may be helpful to bring a favorite item such as a blanket, pacifier, or toy that will make them feel more comfortable. We are very proud to be able to provide our patients with the VEP test, an extra bit of care that you will not find at other optometry clinics.